Here's an interesting trend I've found at university presses -- many of them publish tomes from politicians in their home regions, whether memoirs or prescriptions for political change. The first time I noticed it was during a wonderful visit to the University of Arizona Press when Senator Dennis DeConcini: From the Center of the Aisle was in press, written with Jack L. August. 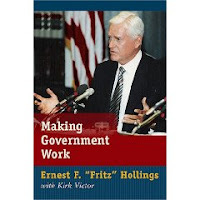 Then this season, while I've been working as Chair of the 2008 Centennial Book Fair at the National Press Club, I was pitched Fritz Hollings's new book Making Government Work from the University of South Carolina Press, written with Kirk Victor. Ten years ago the University of Illinois Press published a recently discovered memoir by legendary Senator Everett Dirksen (the Dirksen Senate Office Building is named for him).